First row, from the the left: Mao Zedong, Dong Biwu, Li Da, Liu Renjing, Wang Jinmei, Chen Gongbo. 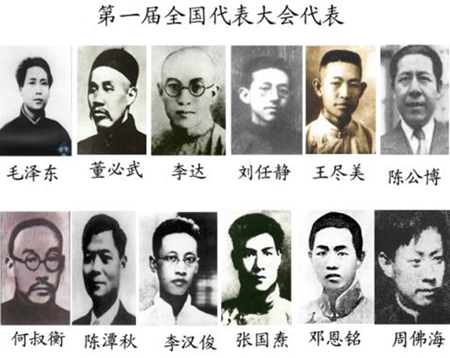 Second row, from the left: He Shuheng, Chen Tanqiu, Li Hanjun, Zhang Guotao, Deng Enming, Zhou Fohai. More than 20 years after the crackdown of the Beijing Spring, on the night of 3-4 June 1989, could China experience another revolutionary spring, contaminated by the wave of protests and revolutions that has swept through the Arab world during 2010-2011? Within three decades, China has moved from isolation from the international stage to the status of a global power. In the wake of the 21st century, the ninety year old Chinese Communist Party (CCP) (one of the oldest political parties in the world which has been in power for more than 60 years without sharing) has undeniably changed its nature compared to what it was at the time of its foundation. In 1921 a clandestine party; in 1935 a party on the edge of extermination; in 1949, the Party of the Chinese nation that had triumphed over the imperialist and nationalists forces; in 1966, a Party over which Mao had regained control because he refused to let it become a bourgeoisie Party so he revived it through another revolution, of the cultural kind; or in 1989 a Party reaffirming its totalitarian nature to the world by its tanks crushing demonstrations by youths exhilarated by democracy whilst the communist bloc in Eastern Europe was singing its swansong. More than 20 years after the crackdown, the CCP is still leading the country on its own, and maybe even better than ever before. It is today an organization whose ideological and structural dimensions have fundamentally changed as the political power has kept adapting and renewing itself not in a survival mode, but to remain relevant while heading the country for the long-term. What is then the longevity recipe of the Chinese Party-State? In order to understand the dynamic of political regimes and how they evolve, it is necessary to understand its elite in action and in interaction. In China, although the word “elite” covers a particularly changing and complex reality, we can distinguish two main categories: the political elite and the socio-economic elite. Once the victims of recurrent political campaigns in the history of the People's Republic (just like other social categories) the political elite now circulates within the nomenklatura according to regulations that have been progressively institutionalized to ensure the renewal of leading cadres since the start of the reforms in 1978. Nevertheless, these central and local leaders, whether they were entirely or partially trained abroad or in the People's Republic, are still largely promoted according to the same cooptation rules as for their predecessors and going through Party schools to complement their training remains a must for any civil servant whose ambition is to be part of the elite cohort, of around 80,000 leaders. The fourth generation of leaders, led by President Hu Jintao and Premier Wen Jiabao, is very different from the three previous ones of Mao Zedong (1949-1976), Deng Xiaoping (1977-1989) and Jiang Zemin (1989-2002) because it was marked by the Cultural Revolution. It will be replaced in 2012 by the fifth generation of leaders, probably led by the current Vice-President of the Central Military Commission, Xi Jinping. Although the vast majority of leading cadres received an academic training in sciences, usually in an engineering school, more and more leaders now come from academic streams such as economics, law or public administration. At the top of the China socio-economic pyramid are the upper socio-professional categories, such as those academics and scholars, entrepreneurs, managers of the private sector, artists, lawyers, etc. who have either emerged, or been rehabilitated, since 1978. The socio-economic elite is largely composed of urban residents from coastal China. Although they are rather well-off, they have diverse socio-cultural and economic backgrounds. Whereas some private entrepreneurs have succeeded in business and accumulated impressive wealth despite an education disrupted by the Cultural Revolution, most of this elite were educated in mainland universities and more and more from universities abroad. Although this class is a minority, social scientists do give them a lot of attention, the question being whether Chinese entrepreneurs could follow their British counterparts of the Industrial Revolution and whether the rest of China's upper middle class could follow in the steps of the bourgeois during the era of Enlightenment, the former and the latter having been great supporters of democratization. Having (r)established their socio-economic status thanks to governmental policies during the reform era, although this elite has gained some autonomy vis-à-vis the Party-State, for the time being it is not challenging the legitimacy of the regime in place to which it owes a large part of its social ascension. Precisely because it constitutes a minority among the very privileged at the top of a very polarized socio-economic structure, it does not favor the emancipation of the masses because it fears “social chaos”. Thanks to the policy of reform and opening-up to the outside world, public intellectuals did indeed hold salons (gathering) in the spirit of those that characterized France in the 18th century. 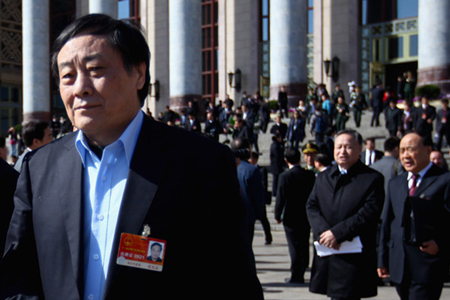 The Tian'anmen crackdown silenced the opponents to the regime, forcing many into exile. In the following decade, those who still wanted to contribute to a better future had to change strategies and converted into experts-advisors of the power in place, thus constituting think tanks that have kept growing in importance ever since, as shown by the Global Think Tank Summit held in Beijing in July 2009, that gathered around 900 participants and that was organized by a super think tank (chaoji zhiku), the China Center for International Economic Exchanges. If think tanks are nothing new in China (some claiming they can be traced back to Confucius' time!) in the years 2000 and 2010, they have become semi-governmental organizations whose predominance and development are unprecedented. The core group composed of public intellectuals, among whom are economists who returned home after having obtained their Ph.Ds. in the West, is now joined by an increasing number of highly ranked leading cadres who are seeking positions in the most renowned think tanks and best ranked universities in China, some even whilst still holding their government positions. Managers from the private sector and the state-owned enterprises add to this group: in exchange for the financial support the business community provides to the think tanks, the economic elite can expect to be able to influence certain debates to profit their businesses. Thus, these three different elite groups consisting of political leaders (in position or retired), business people and public intellectuals meet together in think tanks that accumulate political and financial power with knowledge. An elite united in plurality or plural in unity is the image conveyed by China. The impact of this close to “incestuous” union on the evolution of the nature of politics and policies in China remains to be analyzed. For the time being, one can say that think tanks are very far from the salons of the Enlightenment and those of the 1980s in China. This elite comes together not in order to overcome the one-Party rule, but to its ensure its continuity, by redirecting public policies in order to make the Party-State as reactive and legitimate as possible. Hence, after the successful elitist turn in the wake of the 2000s by inviting private entrepreneurs to become members of the Party, as demonstrated by the evolution of the think tanks' members, since then the Party has made another turn, of a Rawlsian nature, by trying to reconquer its social base, thus following the advice of another school of experts, who claim to belong to the New Left: reducing social inequalities for a fairer socio-economic development; compensating for its mistakes and lack of capacity by acknowledging the social work of Chinese NGOs and relying of the latter for certain social issues. All this, done without any significant liberalization of the political system, is indeed the new social contract that the leading elite has been proposing to Chinese society. All the surveys done so far, whether by Chinese or foreign scholars, tend to show that overall the population support the power in place. The 80 million members of the Chinese Communist Party today, and still growing steadily (although these members adhere more by interest than by conviction) testifies to the popularity of the Party. Whether we like it or not, China has forged for herself her very own path of development, different in many aspects from any in the West. One still has to characterize this Chinese model acclaimed by the vast majority of its elite and its people. Without excluding the possibility of a wave of insurrections by the millions left out of the economic growth and those who have been deprived by the regime (who could paralyze a few key areas across the territory) it seems that given the achievement record of the Party for the last 30 years, China is not yet ripe for a new revolutionary spring.